With Trane Intelligent Services, you get energy management systems and services that facilitate monitoring, analysis, alerts, reporting, tracking and data visualization of your building and system information. 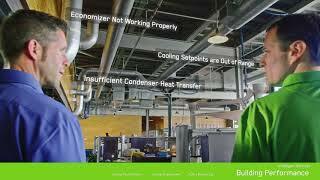 Trane works with you to assess building data and develop a plan that fits your needs. Trane building professionals use their expertise and innovative technology to provide targeted recommendations to positively impact your business, so you can focus on what you do best. The result is a complete energy management solution tailored to your needs to deliver improved building performance, sustainable operations and reduced operating costs. Analyzes data and equipment behavior in the context of the overall system to see what’s happening in your building, unleashing the power of building data to uncover hidden information and opportunities for improvement. With ongoing analysis and recommended actions for improvement from Trane building professionals and experienced energy engineers, you get proactive, data-driven insights and solutions to help keep your building running optimally. A system-wide initial assessment provides a picture of where your building is today. Based on the assessment, Trane building professionals provide recommendations for improvements that can be made and where you building can better meet your business goals. Data transformed into intelligence and support from Trane helps you easily identify inefficient HVAC systems or subsystems, reduce operational costs and energy consumption, and ensure continued efficient performance and additional gains with ongoing analysis. A cloud-based building energy management system (BEMS) service designed to uncover energy waste in every corner of your building. By pairing our advanced technology with the extensive expertise of Trane building professionals, we can help you make smarter, cost-effective decisions about the way you manage and maintain your building. Building energy data is aggregated using powerful visualizations and robust analytics that uncover hidden savings opportunities. Then ongoing assessments by Trane energy engineers provide Energy Conservation Measure (ECM) recommendations to continuously improve energy performance. Real-time energy monitoring helps drive down energy costs by discerning where and when energy is being used, so you can spot anomalies, prioritize building equipment issues and implement schedule changes based on budgetary impact. Advanced analytics let you easily track metrics and make decisions based on that information. Ongoing assessment and advisory services from Trane building professionals help keep your building on track, for continuous improvement. Identifies how your building uses energy, providing a baseline of building performance that shows the potential for improvement. And that’s only the beginning. Trane building professionals utilize advanced tools to visualize and measure your building’s energy profile in a way that transforms data into meaningful information, to help you identify and monetize impactful energy projects for sustained results. Those same tools provide information to help you validate and track the impact of your actions. Trane building professionals utilize advanced tools that transform building data into easy-to-understand information, and they provide ongoing support and expertise. 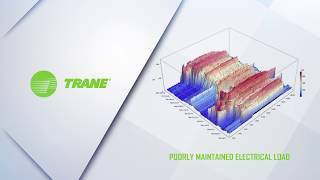 Energy Assessment with Trane uses tools to transform data transform data generated by building meters and submeters into detailed, 3-D optical energy reports and help you easily see ineffective use of energy to fix it quickly. You can also visualize building energy use and compare it to peer buildings and its own past performance, to uncover opportunities for better efficiency. Provides 24/7 support and continuous monitoring of building systems, to proactively detect issues and keep critical systems up and running. Trane building professionals analyze what each alarm means, to resolve issues quickly or initiate action, saving you time and money. Quickly detect failures in your building with round-the-clock monitoring from the Trane Intelligent Services center, where Trane building professionals provide support 24 hours a day, 365 days a year. Beyond alarm detection, Trane building professionals with deep industry expertise analyze each incoming alarm and initiate action to resolve the issue, to maintain efficiency and performance. The ability to address some problems remotely saves time and money in on-site service calls and reduces the amount of time your staff spends detecting and fixing issues.